There’s more new at Tolosa Winery than this year’s vintages. 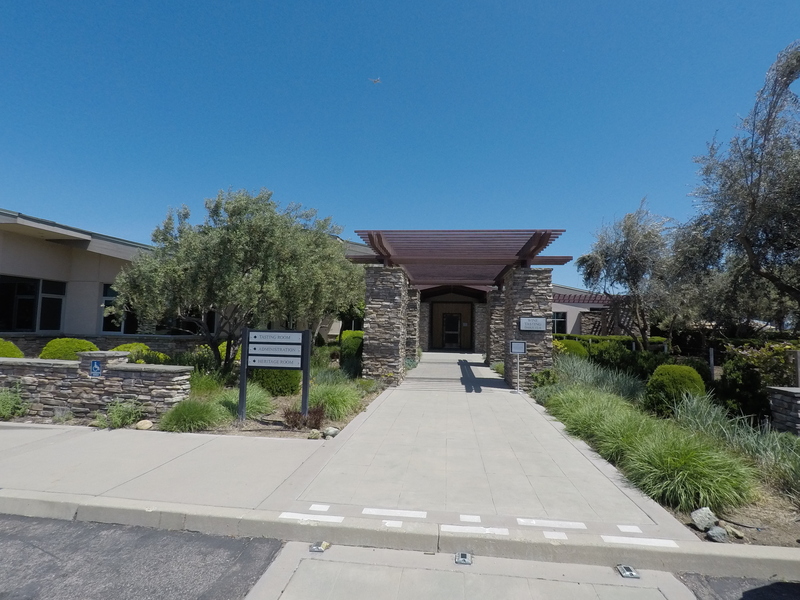 This Edna Valley AVA winery has its eye on an even higher level of quality in every aspect of the operation. A few months ago, the Flavor Team had the opportunity to attend our first World of Pinot Noir event and the Edna Valley Collective Dinner. The interesting people at our table made for great conversations about wine, winemaking, hobbies, and all things Central Coast. Among our fellow diners were Stephen and Paula Dooley with Stephen Ross Vineyards (learn more about the Stephen Ross Winery: Winemaker Focus: Stephen Ross Dooley), and Darren Worley, Director of Sales at Tolosa Winery. The entrance to Tolosa Winery sets the stage for the experience to come. It turns out Darren also spent a lot of time in Colorado, so we had a great conversation sharing memories of places, from Denver to the Sangre de Cristo mountains in the southwest corner of the state. As the evening wrapped up, Darren introduced us to James Kress, Tolosa’s winemaker, and invited us to come out for a tour and tasting. 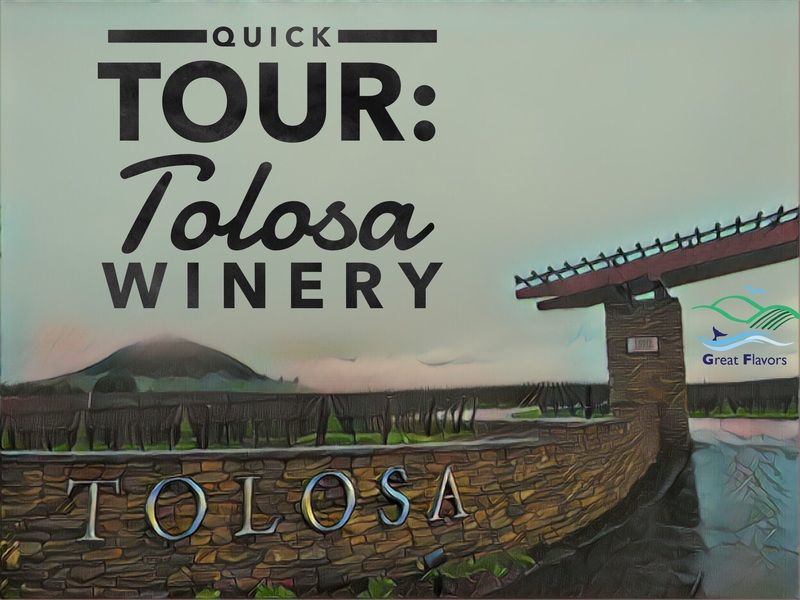 A few weeks later, we made plans to stop by Tolosa and get a glimpse of all the new things going on at this venerable winery. During the brief tour and meeting we had with Mr. Kress, here’s what we learned about Tolosa’s updates, and we hope to share much more to come. 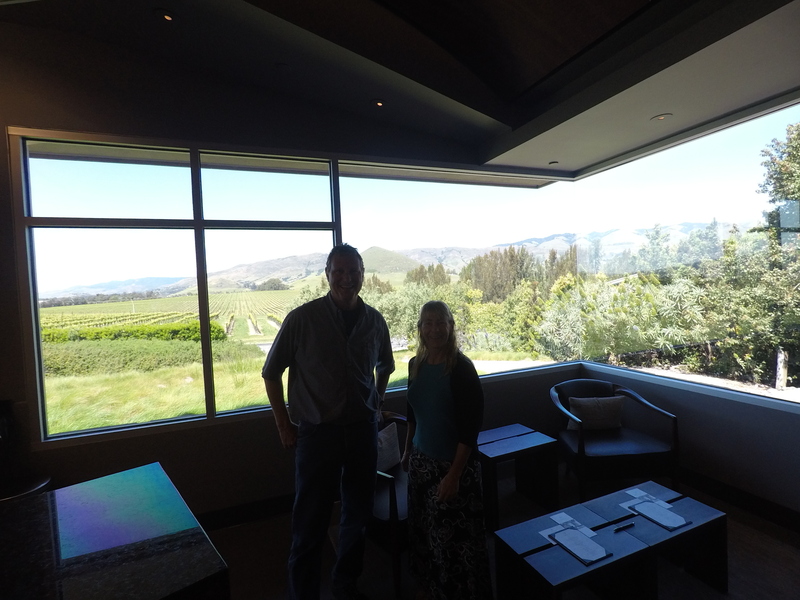 Karen Motto, Key Relationships Manager, meets us in the serene tasting room and introduces us to winemaker James Kress. 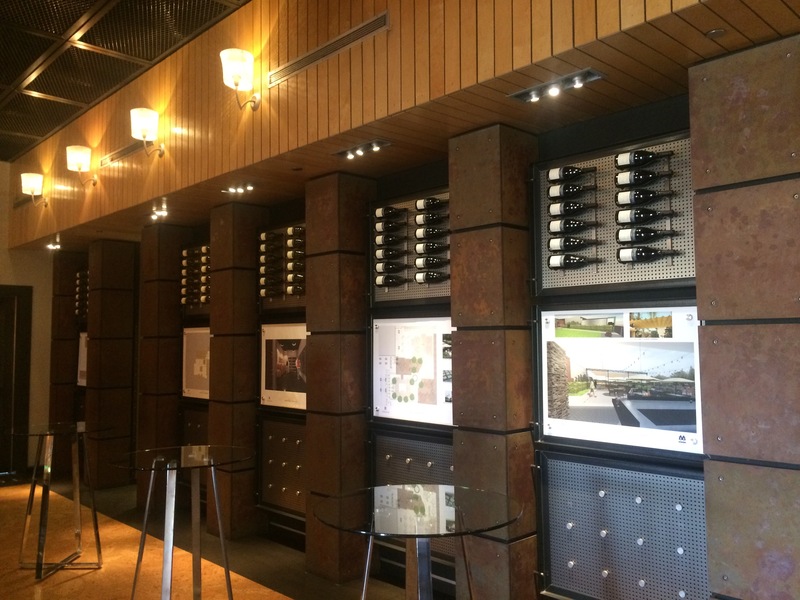 The Tolosa concierge welcomes visitors to the serene tasting room. With 20 harvests under his winemaking belt, Mr. Kress came onboard the Edna Valley-based Tolosa in 2014. He had some input into the wines for those years, but “Jim’s touch will be fully evident in the 2016 harvest and resulting wines,” shares Karen. 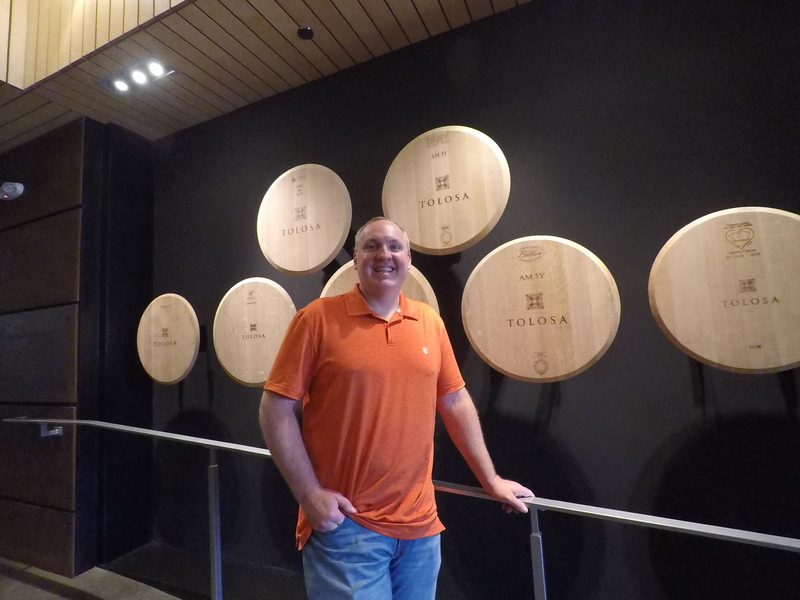 Tolosa is not the first winery to bring in a new winemaker, but we wonder about the challenges. How does a new winemaker integrate his or her talent and vision into the wines while maintaining connection to the established brand and devoted customers? Asked his favorites, Mr. Kress is passionate about Pinot Noir. “There’s so much variety and potential in Pinot Noir grapes, and their temperamental nature can produce exquisite rewards when the winemaker allows the wine to speak to its true nature.” He also appreciates Pinot Noir’s versatility with food pairings. We make our way to the clean, spare space of the new barrel loft, which has the feel of modern-art gallery. Here, though, the works of art are in barrels, not hanging on the walls. The barrel loft brings single varietal tasting to a new level. Flavor Team member Andrew on the way to the Barrel Loft. We head down the stairs to the reconfigured fermentation room, where brand-new, custom-made tanks await this year’s production. Made by La Garde and designed by Mr. Kress, the 3-, 5-, and 10-ton tanks are rectangular. “This allows maximum space efficiency and exposure of juice to skins,” he shares. Karen Motto explains how the Barrel Loft showcases the quality of Edna Valley wines. 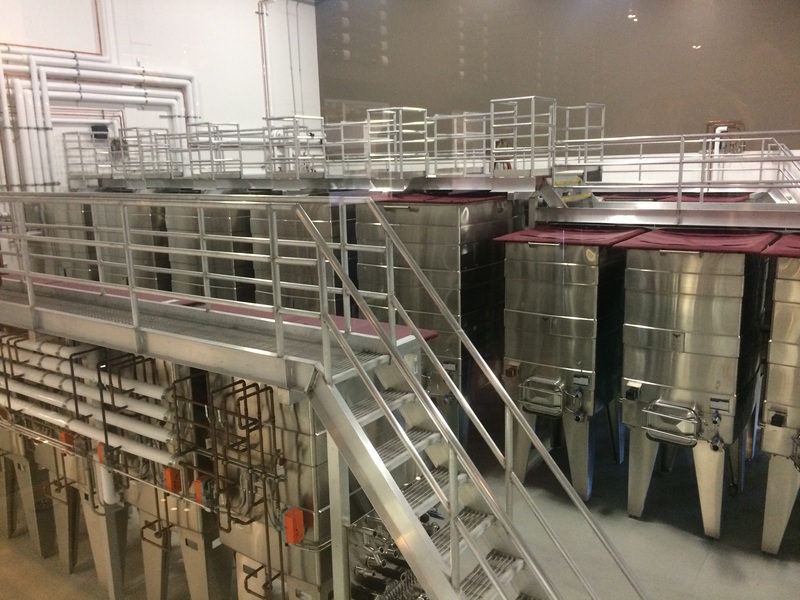 Each is fitted with heating and cooling jackets, so each can be used for red or white fermentation. “We’re using the highest level of technology with old-world winemaking craftsmanship,” explains Karen. Tolosa is upgrading more than its winemaking equipment. “Every aspect of Tolosa is undergoing change – with the end goal to elevate the entire experience for all of our guests,” shares Karen. 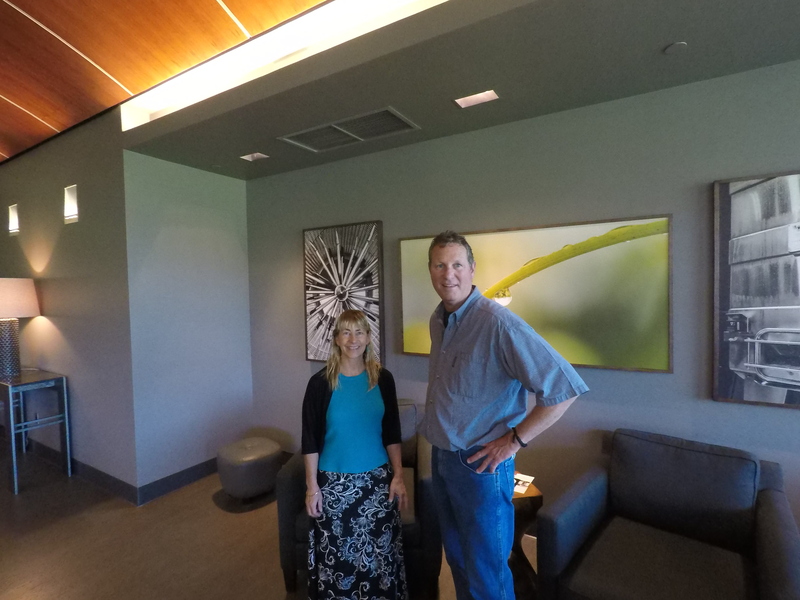 She holds open the door to the private room, which is used for small parties, private tastings, and winemaker events. New stainless steel tanks, custom made by La Garde, fill the reconfigured fermentation room. Mr. Kress walks straight to the uninterrupted wall of windows behind the bar. It perfectly frames the view of Islay Hill, the Edna Valley, and part of the Hollister vineyard, which is among the 720 acres Tolosa has planted. “I never get tired of that view,” he says. 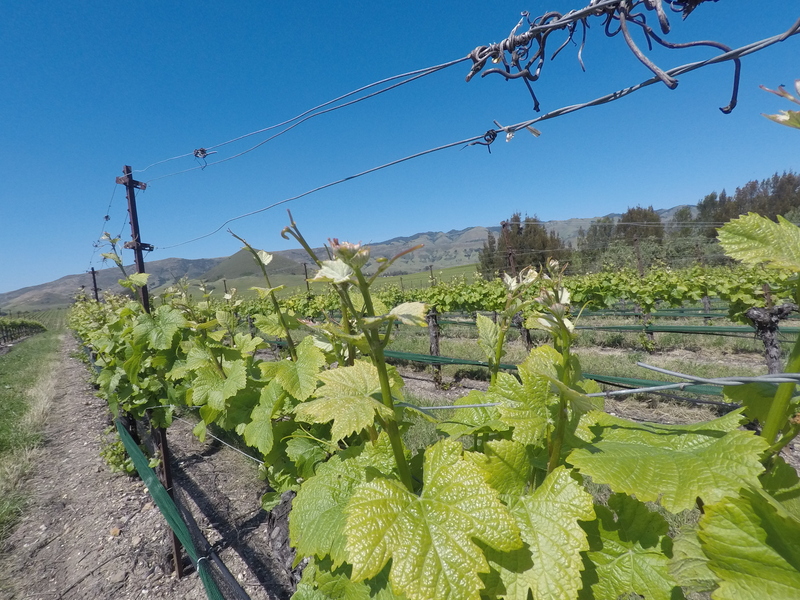 While Edna Valley is known for Chardonnay, and rightfully so, “it’s also the perfect climate for Pinot Noir,” shares Mr. Kress. Winemaker James Kress silhouetted against the view of Hollister vineyard. James Kress, winemaker for Tolosa Winery, in the private event room, talks about his passion for the soils, the grapes, and the possibilities of the 2016 harvest. We step out to the sorter and crush area, where Mr. Kress has some more new toys to play with this year, including a state-of-the-art optic sorter. As we head back to the tasting room for a quick tasting after our tour, we pass the outside patio and tasting area. Like so many things at Tolosa this year, it’s being refurbished and remodeled – all to bring the best overall experience for tasting the range of quality wines Tolosa has to offer. 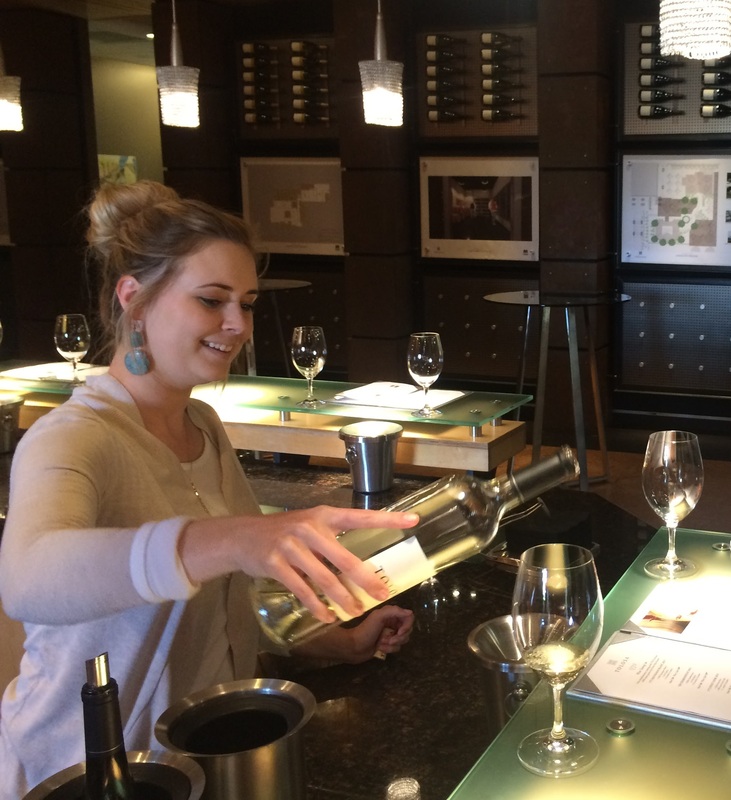 Courtney in the tasting room pours the Flavor Team several vintages of Tolosa Winery’s Chardonnay and Pinot Noir wines. 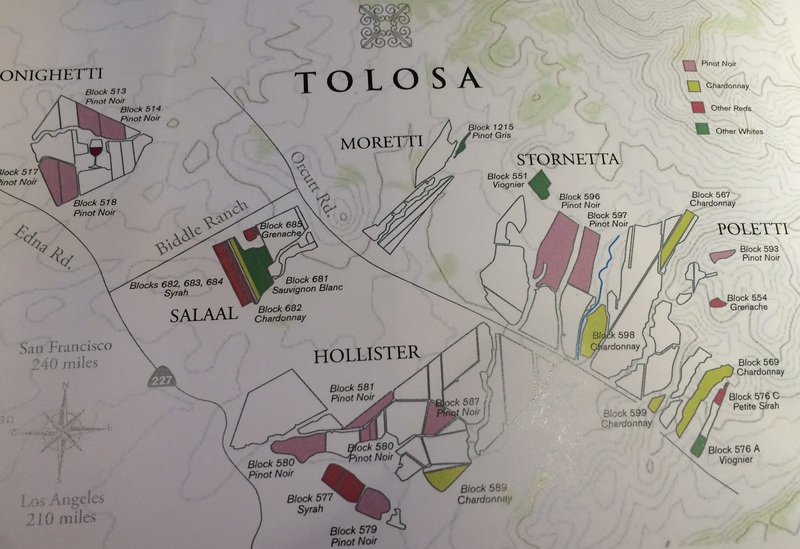 Tolosa Winery’s many vineyards, each with different soil composition and microclimate, which tap winemaker James Kress’ talent and instincts for creating the best wines from each block. The Marley Anne (one of the granddaughters of the owner) is from some of the youngest vines in the 517 and 515 blocks. The 1772 sources two of the same blocks for its fruit. The Marley Anne is deeper, with black fruit, warm spice and cigar box aromas, while the 1772 is a lighter body, more red cherry and berry aromas. A new winemaker bringing his touch to the next vintages, new equipment, new approaches to client relationships and the many facets of the Tolosa experience – all significant changes to undertake in the same timeframe. As we leave the quiet tasting room and step back into the sunshine, we talk about the questions that arise for us and how these elements may combine to answer them. We look forward to seeing the results of how talent and technology will coalesce, and we’re excited about the 2016 wines and getting a taste of Mr. Kress’s vision and producing the next chapter of Tolosa’s strong presence in the Edna Valley and maintaining the winery’s reputation in the industry. Vines in the Tolosa Winery’s Hollister vineyard await the 2017 harvest.